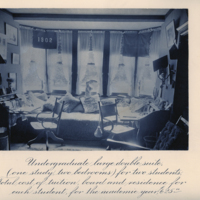 One of the most heavily emphasized features of Bryn Mawr's architecture was the fact that each student was given at least one room of her own--some two or three. 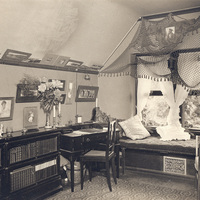 This secured a private place for students to study and entertain, something that most women would not have experienced. 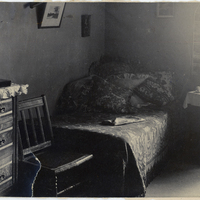 In 1929, forty-four years after Bryn Mawr’s dorms opened, Virginia Woolf made the claim that a woman must have a room of her own and five hundred pounds to support herself and write well. 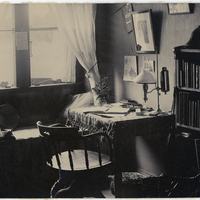 As Woolf asserted, a physical space gave one not only physical freedom but room for the imagination. 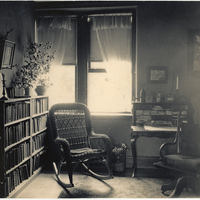 It seems likely that the emphasis on women having rooms of their own and, more broadly, a college of their own, lead to the public's deeply spectatorial curiosity about the life of women scholars at Bryn Mawr. 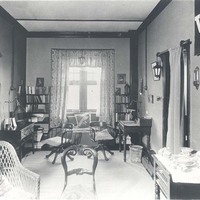 There was so much interest in student dorms that several newspaper articles featured Bryn Mawr rooms. 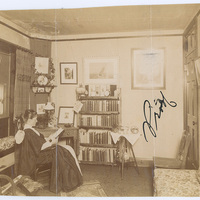 One example, written in the 1890's, is "The Merry Girls of Bryn Mawr". 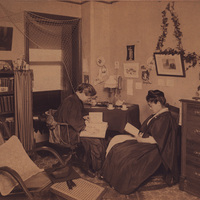 As suggested by the header of the article, "How the Girls Furnish Their Rooms", one of the main draws for readers was getting a feel for the aesthetic and environment in Bryn Mawr dorms. 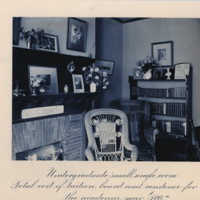 Not much about the furnishing is actually written into to the article, though there are some sketches of rooms. 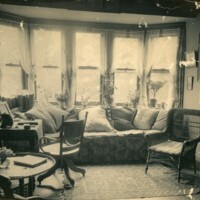 Most of the article actually describes a day in the life of Bryn Mawr students and how they spend their time. 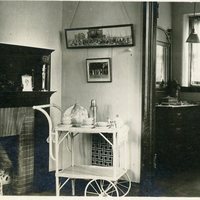 This suggests that there may have been a sense of anxiety about how women, who have their space, choose to spend their time.